During my last backpacking trip I noticed that zipping together two sleeping bags could create a more cozy sleeping system. This got me thinking about what sleeping bags zip together the best and how you should go about finding one. Many couples like to sleep together, so it’s only natural that they would be interested in finding sleeping bags that could be zip together to form one large sleeping area and maximize tent space. So I did a little research about what sleeping bags are the best to zip together. Sleeping bags are usually designed for one person and aren’t capable of being combined due to offsetting zippers. Only right sided zippers can be mated with left sided zippers to combine two backpacking sleeping bags. Let’s look into these common problems that make finding a backpacking sleeping bag that zips together difficult and what you need to do about it. Why Zip Together Backpacking Sleeping Bags? Zipping together sleeping bags is a quick way to increase the size of your sleeping area and provide extra warmth on cold nights. Many couples also prefer to sleep together if possible. But even if you backpack alone, combining sleeping bags can provide you with room to move around and added cushion for uncomfortable sleeping positions. One of the issues some couples have with backpacking is the isolation of sleeping separate. In order to complete the bonding experience, couples now have the ability to zip together their backpacking sleeping bags into one sleeping space. This is especially convenient on cold nights where body warmth can be doubled. 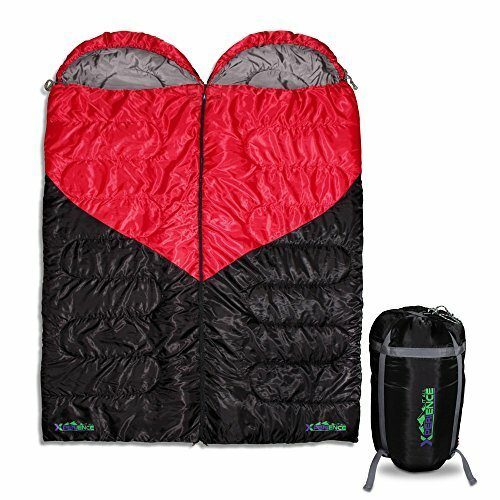 What Are The Best Backpacking Sleeping Bags That Zip Together? Even though many backpacking sleeping bags are not compatible with zipping together, there are a few sleeping bags specifically designed for the task. The Teton Sports Celsius XL Sleeping Bagis a 5lb sleeping bag that is light enough to be used for backpacking and designed to be mated with another sleeping bag. It has extra insulation installed around the zippers to eliminate any chilly areas. 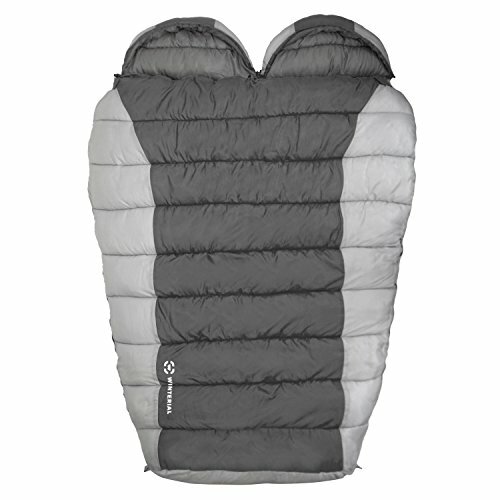 Another option is the Xperience It All Couples Double Sleeping Bag which weighs in at 7.8lbs. It eliminates the need to combine two different sleeping bags and cuts down on multiple zippers that can rob you of warmth. Also receiving great reviews is the Winterial Double Mummy Sleeping Bag which combines two sleeping bags into one sleeping system. It weighs in at 8lbs. Its shell design eliminates zippers and is a great choice for even the coldest nights. Zipping two sleeping bags together is as simple as zipping together a jacket. Simply take the left or right facing zippers and insert the male end of one into the female end of the other. Pull up on the clasp locker to align the zipper as straight as possible and continue to the desired zipper length. Combining two sleeping bags will usually result in a zipper being placed down the center of the combined bags. Outer zippers will be position on the two ends. The combination of zippers on the middle and ends can cause chilly zones in your sleeping bag. Zippers on the edges of the bags can allow for each person to exit the sleeping bag without disturbing the other or having to unzip the center zipper. One of the most common problems with combining backpacking sleeping bags is zipper compatibility. Sleeping bags can be mated if they have opposite zipper layouts. For example, a right sided zipper can be mated with a left sided zipper, but two same sided zippers cannot be mated. Another problem that often arises when zipping together sleeping bags is the loss of heat through the large air gaps that the zippers create. These areas will not be insulated, so the edges of your sleeping bag may be colder than if just one side was zipped. Additionally, once two backpacking sleeping bags are zipped together, your partner will be able to feel every time you toss and turn. For light sleepers, this can be a problem. Even with these issues, the benefits can far outweigh any negatives. Finding the best backpacking sleeping bags that zip together doesn’t have to be difficult. Zipping sleeping bags together helps couples sleep close together and provides added warmth on the coldest of nights. Combining sleeping bags also creates a larger sleeping system that even single people can benefit from. Our top pick is the Teton Sports Celsius XL Sleeping Bag which is designed to be zipped together with other sleeping bags. Additionally, double sleeping bags like the Xperience It All Couples Double Sleeping Bag offer another option for two person sleeping bag that is already connected. Whichever you chose, combining sleeping bags will create a better camping experience overall.